Do you have a banana lover in your life? Make them this Banana Cream Pie! With plenty of fresh bananas, fluffy custard filling, and sweet whipped cream, nestled into a flaky, buttery crust. It’s such a treat! Once again, I have a Father’s Day recipe for you today! Last week it was Boston Cream Pie, for my dad, but this week it’s Banana Cream Pie! I made this recipe in honor of my husband. He’s a great dad to our two boys, and he’s been begging me to make banana cream pie foreverrrrrr. His moment has finally arrived! My husband loves pie. He told me once that if given the choice between pie or cake, he’d take pie every time. Some of his favorites (besides banana cream!) include Coconut Cream Pie and Peanut Butter Pie. And he LOVED when I made Nutella Pie with Pretzel Crust. But today it’s all about the banana, baby. I’m really glad he pushed me to create this recipe, because it ended up being such a treat! WHAT IS BANANA CREAM PIE? Banana Cream Pie is made up of 3 main components: the crust, the filling, and lots of whipped cream on top. 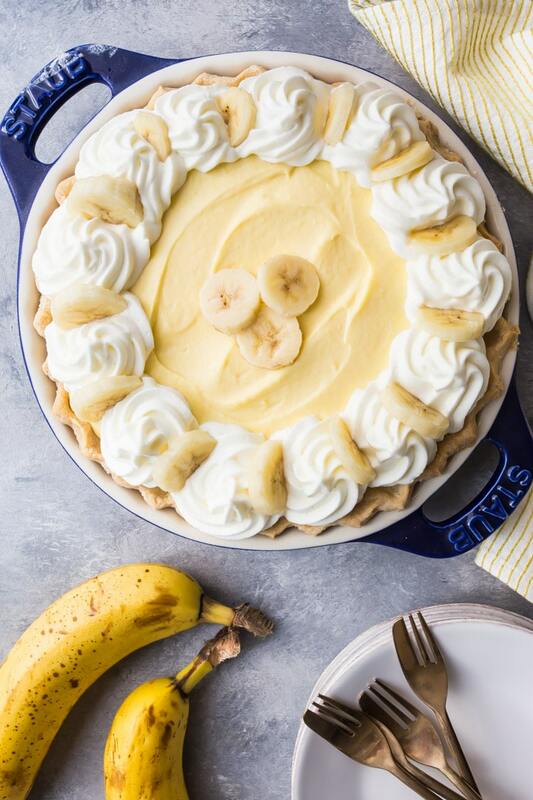 Traditionally, banana cream pie starts with a pre-baked, butter-based pie crust. You can read all about my favorite recipe here: Perfect Homemade Pie Crust. There’s a special technique that makes this crust so incredibly flaky! It’s almost like puff pastry, with all the layers. Definitely check it out! The filling begins with Pastry Cream, which is a rich custard similar to vanilla pudding (but better!). 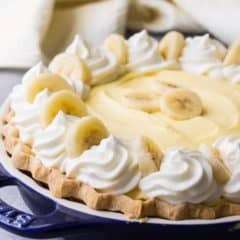 You can just use that, as-is (your pie will be firmer and not quite as tall), but for this banana cream pie recipe, I chose to fold in a little whipped cream. It makes the filling so fluffy and good! Make sure you add plenty of fresh bananas! It is banana cream pie, after all. This recipe has 2 layers of sliced bananas in the filling, plus a few more slices on top for garnish. And big swirls of fresh whipped cream! IS BANANA CREAM PIE BAKED? The filling is not baked, but the crust typically is. Usually the crust is just a regular baked flaky pie crust, but you can make it with a cookie crumb crust if you want a no-bake option. Check out the recipe here: Graham Cracker Crust. <--i think it would be really good if you subbed Vanilla Wafers for Graham Crackers! Almost like banana pudding. Yum. You can totally freeze this banana cream pie! It will freeze hard, like an ice cream pie. You might want to leave it out at room temperature for 10 minutes or so, just so that it’s easier to slice. Frozen banana cream pie is so good! This would be a great way to serve it during the hotter summer months. CAN BANANA CREAM PIE BE MADE AHEAD? Many of the components of this banana cream pie can be made ahead. I would definitely make the pie dough at least a day or two ahead, so that it has plenty of time to rest & chill in the fridge. You can bake it 24 hours before you plan to fill it. Just keep it wrapped in a plastic bag so it doesn’t get stale. The pastry cream also does best if it’s made ahead. I like to give it at least two hours in the fridge to cool completely and firm up. Overnight is even better! It will keep in the fridge for several days. But you need to watch out with the garnishes. The bananas that are layered inside the filling can do ok for while, because the air doesn’t really get to them and turn them brown. But the slices that garnish the top of the banana cream pie will start to oxidize pretty quickly. So I would leave those off until just before serving. And whipped cream does tend to lose its volume over time. It can deflate or weep. So I would also save that for just before. Or, you can top the pie with this Whipped Cream Frosting. It’s got a few secret ingredients that make it more stable so you can make it up to 48 hours ahead. WHY IS MY BANANA CREAM PIE FILLING RUNNY? The pastry cream will thicken up a lot as it cooks. Just as it starts to come to a simmer, it will tighten up to almost a pudding-like consistency. And then it will become even more firm as it cools. Make sure you give it enough time on the stove to fully thicken. If it’s runny in the pot it will probably be runny in the pie! The whipped cream should also be quite stiff. You can get a better sense for what I mean if you check out the recipe video below. Whip it to a very stiff peak, and fold it into the pastry cream gently, so as not to knock all the air out. I would also suggest folding the whipped cream into the pastry cream at least 2 to 4 hours before you plan to serve it. Fill the pie crust with the cream and the bananas, and pop it right into the fridge to chill so it stays nice and firm. Banana cream pie is best served cold! So definitely keep it in the fridge if you can. It’s so refreshing and a perfect dessert for the warmer months. 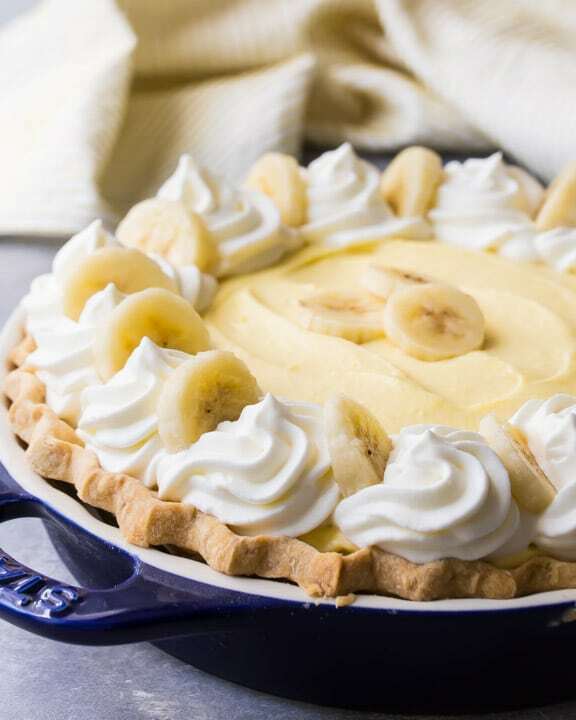 You’re going to love this banana cream pie recipe! It’s so good because everything is made from scratch. You just can’t beat that for taste! 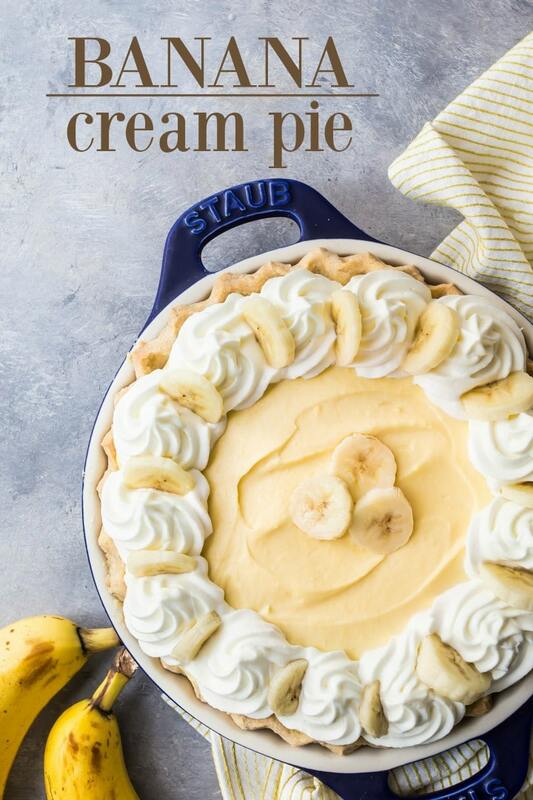 So if you have a banana cream pie lover, definitely make them this pie! It will make them so happy! Do you have a banana lover in your life? Make them this Banana Cream Pie! With plenty of fresh bananas, fluffy custard filling, and sweet whipped cream, nestled into a flaky, buttery crust. It's such a treat! Add the oil, and stir until the mixture resembles coarse meal. Gather the dough into a ball, and shape into a disk. Wrap tightly in plastic wrap, and refrigerate for at least an hour. Roll the dough out to ¼” thickness, and fold into thirds. Fold into thirds again, then one more time, and refrigerate for another hour. Unwrap the dough and roll to about two inches larger than the diameter of your pie plate. Slip the dough into the ungreased pie plate, and prick with a fork. Fill the unbaked pie shell with ceramic pie weights or dry beans, and bake for 32 to 38 minutes, or until golden. Place the yolks, sugar, cornstarch, and salt in a medium bowl and whisk to combine. Heat the milk in a small pot until small bubbles form around the edge, and wisps of steam are rising from the surface. Add the hot milk to the egg mixture, a little at a time, whisking to combine. When all the milk has been added, transfer the mixture back to the pot and place over medium-low heat. Cook the pastry cream, whisking, until thickened. Stir in the vanilla, and pour the pastry cream through a fine mesh strainer, into a heat-safe bowl. Use the back of a ladle to press the mixture through the sieve. Press a layer of plastic wrap directly onto the surface, and refrigerate for 2 hours minimum. Whip the cream until it holds stiff peaks, and fold it into the pastry cream. Line the bottom of the pre-baked pie crust with slices of fresh banana, and spread half the filling on top in an even layer. Place another layer of sliced bananas over the filling, and smooth the remaining filling on top. Garnish with whipped cream and more sliced bananas. Whip the cream and powdered sugar together until it holds soft peaks. Transfer the mixture to a piping bag fitted with a 1M open star tip. 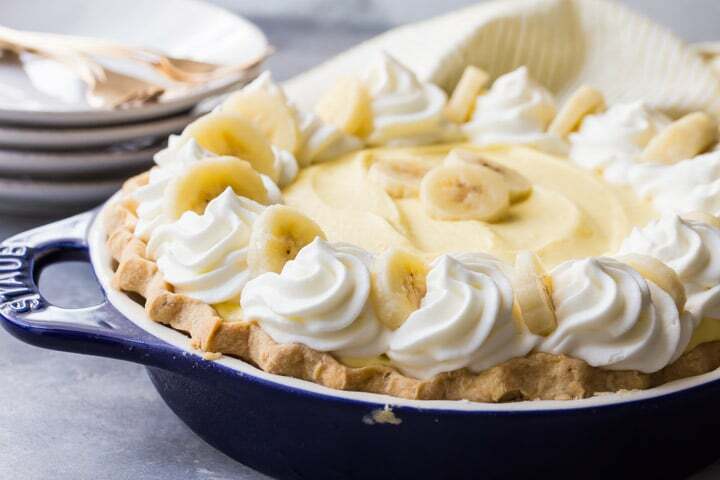 Pipe swirls of whipped cream around the edge of the pie and garnish with sliced bananas. For more info on how to make the pie crust, click here: Perfect Homemade Pie Crust. For a no-bake pie crust option, click here: Graham Cracker Crust. For more info on how to make the pastry cream for the filling, click here: How to Make Pastry Cream. Mmm! A family favorite over here! This is so perfect for summer picnics! I don’t know what pastry creme is; I don’t know how to make a pie crust, but after watching that video, all what I did was smile. Now that is LOVE. Your husband is very lucky. How spectacular. Aw, what a sweet comment Amanda! Thank you for brightening my day with your kind words. I will be sure to tell my husband how lucky he is, lol! The perfect pie for any banana lovers, that is for sure! So pretty too! What size pie does this create? Hi Michelle! There is a link to the exact pie pan I used just above the video. 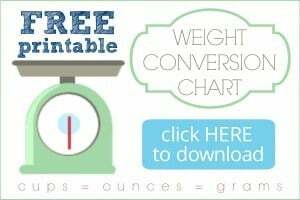 It is 9-inches in diameter. Hope that’s helpful! My pleasure! I’m so glad you enjoyed it. Congrats on your first pie! Can I use a Graham cracker crust instead? That would be fine! Here is the recipe: https://bakingamoment.com/graham-cracker-crust/. Hi I was just wondering where you got your pastry cream or if you made your own and if you did what recipe you used? I’m making this for my brothers birthday and want it to be just right! Hey Cassie! I’m not sure I understand your question- the pastry cream recipe is within the recipe card. So happy you liked it Helen! Hi. Can you explain step #8 to a non-baker like me? Hi there! You just want to roll out the dough (with a rolling pin) until it’s big enough to cover your pie dish, with a little extra overhang that you can use to make a decorative edge. If you check out the video I think it might make more sense. Good luck! Thank you so much for responding! But I should have clarified- step 8 of the filling- not the crust. So what does it mean to “whip the cream until it holds stiff peaks and fold into the pastry cream”? Oops, sorry! Have you ever whipped cream before? You just whip it with a whisk or an electric mixer until it’s fluffy and stiff. Then you add it to the pastry cream filling, and fold the two together. Does that make sense? Makes perfect sense now! Thank you! And can I bake this pie the day before it will be served and just decorate or put the top layer on minutes before it is served? Hi again! You can, but the crust might get a bit soggy and the bananas might turn black. If it were me I would probably make all the components ahead, but wait until just before serving to assemble. Hope that is helpful! THANK YOU for your tips! I was actually following an old family recipe card recipe which was missing some steps, and mine was super runny until I started googling for help. The pudding-like consistency was what I was missing before cooling, so I just put it back on the stove, and it came out perfect! That’s so great to hear Angelica! I’m so glad you found this helpful!